The Federal Government has budgeted only N20, 226, 000 for Ogoni land clean up support in 2018 appropriation bill, while it earmarked N250 million for attendance of international bilateral/multilateral meetings. A total of N27, 369, 935, 852 is allocated to the Federal Ministry of Environment, and out of this N9, 524,482,833 is for capital projects, while debt owed contractors stood at N11.6 billion. 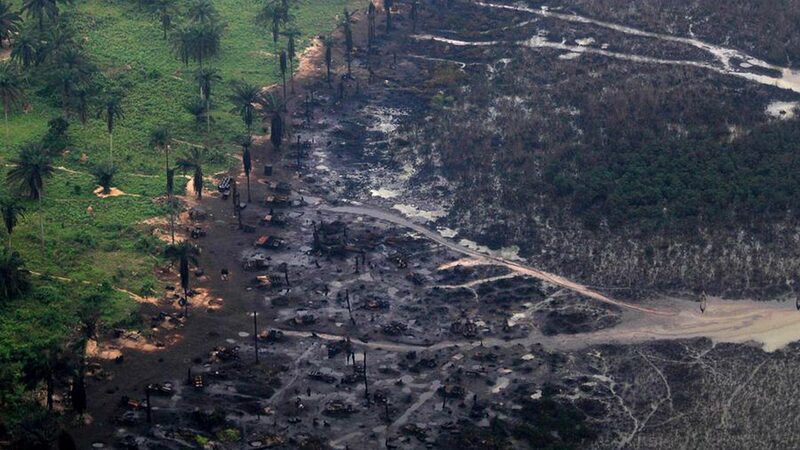 “Although, the International Oil Companies will fund the project, we have made provisions in 2018 budget for the costs of oversight and governance, to ensure effective implementation.”Minister of state for Environment, Ibrahim Usmam Jibril, recently, explained that the clean up of Ogoni land is being delayed due to budget constraints and the ground work before the project would start. According to him, “since the inception of the present.“You can’t do anything if you cannot collect the money if you don’t budget for it; so you have to show your work plan which is what HYPREP has been doing,” the Minister explained.The Director General of National Biosafety Management Agency, NBMA, Dr.Rufus E. Ebegba told The Guardian that they received 50 per cent of 2017 budget allocation to strengthen institutions nationwide. According to him, there are seven ongoing projects since last year and with 2018 appropriation of N689, 882,03, we hope this one would be a promising year for the agency.A break down of NBMA budget allocation, shows that procurement of genetically modified organisms, GMOs detect unit would gulf N13.5 million, while research institutes would take N19.5 million. Meanwhile, developing countries including Nigeria are to receive $540 million under the Montreal Protocol to continue their work to protect the environment and restore ozone layer to pre-industrial age level. Under the Kigali Amendment, Nigeria and others are to phase out ozone-depleting hydro chlorofluorocarbons (HCFCs) and to initiate enabling activities for the phase-down of climate-warming hydro fluorocarbons (HFCs). The funds will be provided by developed countries over the period 2018 to 2020 through the Multilateral Fund for the Implementation of the Montreal Protocol, which has disbursed over $3.7 billion since 1991 to support developing countries to phase out chemicals that destroy the ozone layer. Montreal Protocol parties made the funding commitment during the joint 11th meeting of the Conference of the Parties to the Vienna Convention and the 29th Meeting of the Parties to the Montreal Protocol held in Montreal. There are 197 parties to the Montreal Protocol. Nigeria has been part of a global effort to protect the ozone layer, which scientists discovered about four decades ago, was being depleted by a group of man-made chemicals referred to as ODS such as Chlorofluorocarbons (CFCs), Halons, Carbon Tetrachloride, Methyl Chloroform and Methyl bromide. It is acknowledged that since the Montreal Protocol came into force, Nigeria, like other parties has continued to take actions in line with the provisions of the Protocol towards solving the problem of ozone layer depletion. The actions have led to reductions in the production and consumption of ODS, while the Montreal Protocol is adjudged to be the most successful Multilateral Environmental Agreement (MEA) that illustrates how countries can come together to solve a common problem. Nigeria had a baseline consumption of over 4,000 metric tons of ODS, which essentially are used in various industrial applications. These include domestic, commercial and industrial refrigeration and air conditioning, flexible and rigid insulation foam and in numerous other applications such as aerosol propellants and solvents.